Description: CSX 2804 (formerly Conrail) in current YN3 paint. Description: CSX B787 heads south. Description: CSX B779 heads north at MP 72. Description: CSX B77915 heads back to Watertown. 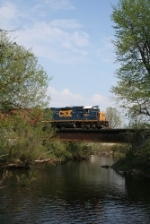 Description: CSX B77915 crosses the Indian River. Description: Southbound B749 about to get off Metro North Railroad's Hudson Line onto CSX controlled Oakpoint Link. Description: CSX B749 heads north towards Chelsea, and Poughkeepsie. North is to the right. 0905 hrs. Description: CSX B749 heads north to Poughkeepsie, to customer American Steel processing at The CNE yard. Note the NORTHERN PACIFIC markings on this MWCX car. Across the Hudson River is the Danskammer Power plant at Roseton, Orange County. 0933 HRS. Description: CSX B749 returns from Poughkeepsie south to Croton. 1248 HRS. There is a VERY limited window to get this photo properly lit. Description: CSX B749 waits for a signal at CP 72, to head south back to Croton. 1124 HRS. Description: C964-18 shifts the Fairless Branch with six geeps, including CSX GP38-2 2795 making a comeback as the leader. The 2795 is looking worse for wear since last time I saw it, with a decent amount of Conrail paint beginning to show. Description: And finally, CSX GP38-2 2804 is the sixth unit on C964-18. 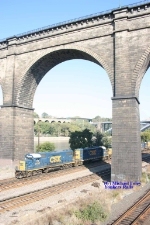 Title: CSX C964 with 6 units! Description: One spot I could fit them all in! Phew!! !